Kitchen : We cook it, we eat it right away or we freeze it ... this creamy chicken pie is a must have! We cook it, we eat it right away or we freeze it ... this creamy chicken pie is a must have! A true comfort food! The kind of recipe that warms your heart and soul. And for me, chicken pie ... is a comforting dish and this time, we'll add 1/2 cup of cream 35%, it will be even better! In a large frying pan, melt the butter and add the onions, carrots, celery and garlic. Cook until vegetables are tender, stirring occasionally. Add flour, salt, black pepper, thyme, parsley, chicken stock and cream, whisk until no more flour is present, then simmer over low heat for 10 minutes. Stir in chicken or shredded turkey and peas. Remove from fire. Preheat the oven to 400 degrees F and place your pie crust on a 9-inch pie plate. Pour the filling into the tart bottom and carefully cover the tart with your second pie crust. Seal the edges with a fork and cut a few small slits in the center of the upper crust. Bake for 45 minutes, or until crust is golden brown. Cool for 10 minutes, cut and serve. 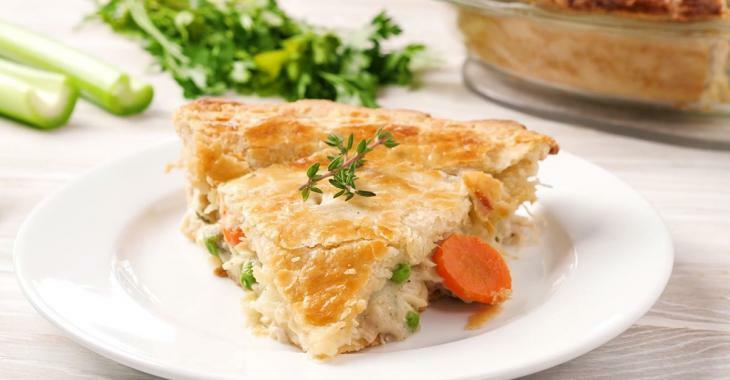 For freezing: Allow the chicken pie to cool completely, the pie freezes for up to 1 month.